In spite of the title this book certainly is of interest for student of the Zarma language and culture. The songhay spoken by the Kaado living in the region of Niger to the west of the Niger river north of Niamey is quit similar to the Zarma. Although songhay and Zarma differ in their discourse, their languages, culture and history are closely linked, more or less comparable to England and the USA, that certain researchers attribute them the same origin (see Bornand, 2005, page 42). The authors intend « to provide a modest contribution to the notion of man in black Africa » through stories told by Zarma's themsleves. The book is bi-lingual. The text on the left hand page is always in songhay and on the right hand page in French. The authors strived for getting across texts purely by all means and say to have done theirs utmost to prevent interpretation of texts. The French text is not a literal translation, but a literary translation. And translation always is, at least partly, interpretation. The songhay text is written in a somewhat different manner than the Zarma in the course « Cawyan Zarma sanni » or in the Peace Corps dictionary (see Figure below), but this should not be a problem after you have finished this course. 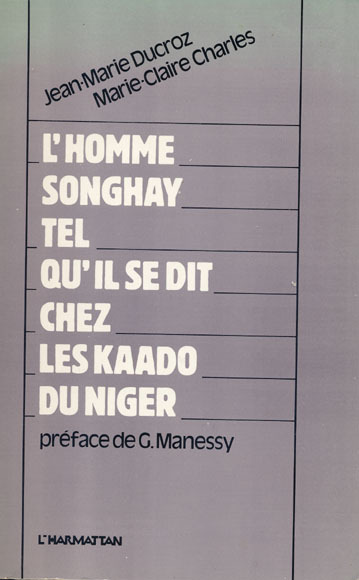 Example of Songhay text from Ducroz and Charles (1982). Read this text in regular spelling and view translation in Lesson 13. This book, with a foreword by G. Manessy, starts with an introduction of R. Nicolaï about the land, the people, the interpreters and their context, and the way in which this project has been carried out. The book also contains a short introduction (3 pages and 2 maps) by the authors, four parts, a bibliography and a table of contents. Each part deals with a topic and consist of several chapters. The first part is about similarities and contrast and consists of seven chapters discussing the following subjects: the elements that form a person, the different part of the body, the differences between man and woman, the differences between Blacks and Whites, the differences between humans and invisible beings, the differences between man an animal and ailments, mental failing, and illness. Two subjects are discussed in more detail, invisible beings and animals. With regard to invisible beings, a description is given of them, the bonds between humans and invisible beings is discussed and the possession of men and women by spirits is described. With regards to animals, not only the differences are discussed, but also the bonds between man and animal. In addition a description of the distribution of the pieces of the slaughtered animals is given. The second part deals with deeds and rites. It concerns deeds or acts that provoke shame, that are reserved to certain circumstances and acts of affection. The rites discussed are those concerning the circumcision (male) and the infertility. The word by the « Kaado » is handled in the third part. Discussed are the taboos concerning the word, the word and silence and the power and efficacy of the word. Special topics are the language of the animals, that used between themselves and with humans, and the language of the invisible beings, also that used between themselves and with humans. The fourth and last part of the book looks like a mix of a dictionary and an encyclopaedia. There are four chapters about the human body and two about idiom. The first chapter shows on each right hand page a picture of (a part of) the human body with a number attached to each body part and on the left hand page the number and songhay and French word for this body part. The second chapter list all body parts alphabetically (songhay) and this list includes expressions containing names of body parts. In this case both the literal translations and the interpreted translation are given. The third chapter also gives an alphabetically ordered list of songhay words that has to do with what the body does or is, for example, alcirka = to have breakfast, taŋgam = to fight (against). A list of illnesses is given in alphabetically (songhay) order in the fourth chapter. Both the literal translations and the interpreted translation are given. For a lot of the illnesses the traditional way of healing is described briefly. Chapter five lists expression regularly used in songhay, while chapter six lists proverbs. For expression both the literal translations and the interpreted translation are given. For proverbs the interpreted translation is given, as well as the meaning of it. To the question: « Will it be good for our children, for the others, all the others, say that, the way that we know the world, life, that we are organised, our way of being songhay is passed on? », posed by Adama Sey to the elderly of the village, they responded: « Yes ». The collected texts thus have a profound originality. It is a question of a « contract ». Once the need of transfer was recognised and approved, Adama collected the stories of the Elderly in order to hand them over to Marie-Claire Charles and Jean-Maire Ducroz, who have, for their part, transcribed these – still in songhay – to make the present work: a self portrait of the songhay man, making it possible to distinguish specific characters of their culture and to comprehend their view of the world. Jean-Marie Ducroz and Marie-Claire Charles were missionaries in Dolbel (Niger) for twentyfive years when they wrote the book. Mr Ducroz was a (catholic) father Redemptorist working among the Gorouol (Kaado) in Niger. He died at the age of 81 in September 2002. He lived in Niger from 1954 to 1990, and had dedicated most of his life to this people. He was called "papa du Gorouol". No additional information was found on Marie-Clair Charles.